Cholera - body, causes, Outbreak!, What Is Cholera? Cholera (KOL-er-a) is an illness that results from infection of the large intestine by Vibrio cholerae bacteria. 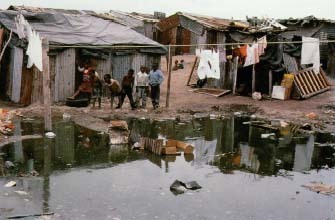 Cholera causes watery diarrhea and vomiting. In January 1991, an outbreak of cholera, a disease that can cause life-threatening diarrhea, began in several towns along the seacoast of Peru. Within months, the disease had spread to many countries in Central and South America. Within two years, more than 700,000 cases and 6,000 deaths had been reported in the western hemisphere. Although cholera usually is not a problem in the United States, some cases occurred in American travelers. In February 1992, 75 people became ill after they were served seafood salad containing cholera bacteria on an airplane flight from South America to Los Angeles. Cholera bacteria live in water. At this crossroads near Capetown in South Africa, human waste contaminates the drinking water and the water used for cleaning and cooking food. © M. Courtney-Clarke, Photo Researchers, Inc.
Cholera is an illness that leads to large, frequent, watery stools (bowel movements). It is caused by infection of the large intestine by Vibrio cholerae bacteria, which secrete a toxin * that inflames the large intestine and prevents it from reabsorbing water. The illness often is mild, but it can be severe. In about 1 out of 20 cases, severe diarrhea and vomiting lead to rapid loss of water from the body, known as dehydration. Without treatment, death can occur within hours. Cholera is spread by drinking contaminated water and by eating raw or undercooked food. The disease is rare in the United States, Canada, Europe, Australia, and New Zealand, thanks to modern treatment of drinking water and sewage, but it is prevalent in Central and South America, Africa, and Asia. Travelers may run into the disease, as happened in the United States when air passengers ate contaminated seafood. The disease does not spread easily from person to person, and casual contact with an infected person does not pose a threat. * toxins (TOK-sinz) are poisonous substances. Epidemiology is the science that studies how diseases spread and how to control their spread effectively. An early epidemiologist was the British physician John Snow (1813-1858), who hypothesized that contaminated water was responsible for the spread of cholera. In 1854, during one of many cholera epidemics, Snow observed that a significant number of people with cholera in the Golden Square area of London all shared something in common: they all used the same water pump on Broad Street. Snow demonstrated that sewage had seeped into the pump's well, contaminating the water, and infecting the community. Thanks to Snow's demonstration that cholera was a waterborne disease, doctors abandoned their belief that "miasma" (a noxious airborne substance) was the cause of cholera. The German bacteriologist Robert Koch (1843-1910) later identified the Vibrio cholerae bacterium as the waterborne agent that causes cholera. What Happens When People Get Cholera? Most people infected with cholera bacteria do not become ill. When illness does occur, it usually appears within a few days of infection and causes only mild diarrhea. About 5 percent of people with cholera become very sick, however, with lots of watery diarrhea as well as vomiting and leg cramps. The result can be severe dehydration. If these people are not given replacement fluids, they can die in a matter of hours. Cholera is diagnosed by checking a person's stools for Vibrio cholerae bacteria. People with cholera need fluids and salts to replace those lost through diarrhea and vomiting. The person may be asked to drink large amounts of a solution that is made from a prepackaged mixture of sugar and salts mixed with water. If the person is too sick to drink, fluids can be given intravenously * . Without such treatment, severe cholera can kill up to half or more of those who become ill. With prompt treatment, however, fewer than 1 percent of people with cholera die. Sometimes antibiotic medications are given as well to decrease the length and severity of the illness. * intravenous (in-tra-VEEN-us) fluids are injected directly into the veins. Drinking only water that has been boiled or treated with chlorine or iodine. Other safe drinks include tea and coffee made with boiled water and bottled soft drinks served with no ice. Eating only foods that have been thoroughly cooked and are still hot. Also safe are fruits that a person peels himself just before eating. Avoiding other raw fruits and vegetables, including salads. Not eating undercooked or raw shellfish or fish. Not buying foods or drinks from street vendors. Not bringing perishable seafood back to the United States. The Vibrio cholerae bacterium under an electron microscope. 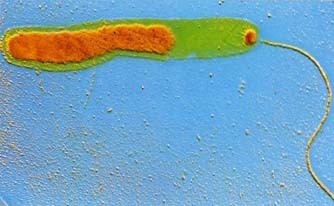 Color has been added to show the nucleic acid (orange) and the flagellum (tail), which is used by the bacterium to move. CNRI/Science Photo Library, Photo Researchers, Inc.
During the nineteenth century, cholera epidemics killed thousands of people in the United States. In 1832, cholera swept through the slave population in Richmond, Virginia. The next year, an epidemic in New Orleans killed almost one quarter of the city's population. Another epidemic occurred in the United States in 1849, and during the 1850s, thousands of pioneers who headed for Oregon or California died on the trail from cholera. The third major cholera pandemic in the United States occurred in 1866. No major U.S. outbreaks have occurred since the 1890s, mainly because government officials learned the value of keeping public water supplies clean. García Márquez, Gabriel. Love in the Time of Cholera. New York: Penguin, 1999. Originally published in Spanish in 1985 as El amor en los tiempos del cólera, this is a complex novel set in a Central American seaport that experiences periodic cholera outbreaks. The author was awarded the Nobel Prize for Literature in 1982. Poe, Edgar Allan. The Masque of the Red Death. A classic tale of terror about the "red death," available in many audiocassette, paperback, and hardcover editions. U.S. Centers for Disease Control and Prevention (CDC), 1600 Clifton Road N.E., Atlanta, GA 30333. CDC posts fact sheets about cholera and information for travelers at its website. World Health Organization (WHO), 525 23rd Street N.W, Washington, DC 20037. WHO's Communicable Disease Surveillance and Response (CSR) division posts a global cholera update at its website to report numbers of cholera cases and deaths worldwide.